Along California's central coast lies the quaint village of Cambria. Here at the pines meet the ocean and visitors stroll along strands of unspoiled beaches. Minutes from Hearst Castle, this is a choice first destination and Bluebird Inn is located on the Santa Rosa Creek, in the heart of this village of historic houses, unique shops and fine restaurants. 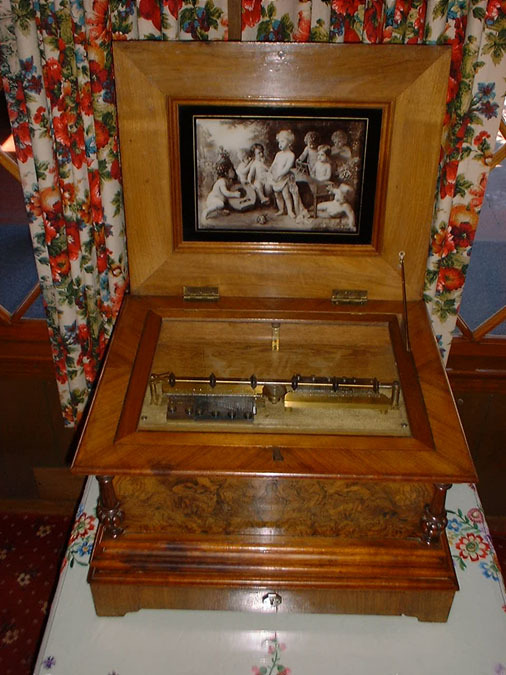 The Bluebird was built around the gracious local landmark, the Lull Mansion. This Victorian style mansion was built in 1880 by George Washington Lull, one of the founding fathers of the region, in honor of his lovely new bride, Mary Inman. 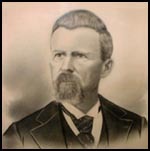 A passing trader in exchange for a horse, hunting knife, chaps and riding money gave Mary to George. Owners and Innkeepers, Ken and Gisela Cooper greet visitors with European stylehospitality. The poppy seed cake served in the morning is a recipe Gisela perfected and travelers remember. 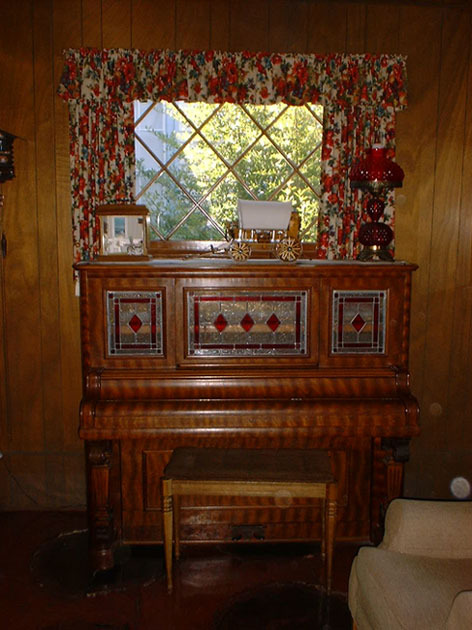 In the 1920's, an open-beam lobby with a flagstone fireplace was built onto the mansion and a motel was built. This welcoming lobby with it's fireside seating, coffee bar, rare baby grand harp upright piano, and intriguing European music box, feels like a mountain lodge. 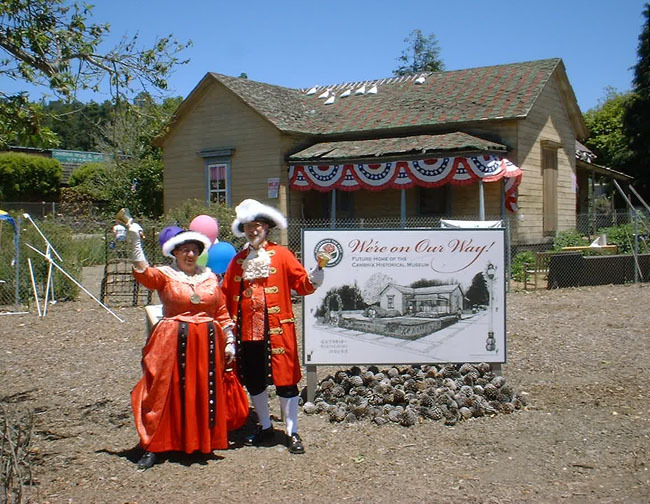 There are some significant historic sites to see when visiting Cambria. These include The Santa Rosa School building, The Santa Rosa Chapel, restored in 1995 and The Old Cemetery. Soon visitors will be able to learn of the history of Cambria and the Central Coast at the new Cambria Historical Society Museum that will be located in The Guthrie-Bianchini House currently being restored. Until then, everything you need to know you can learn from Ken Cooper as you sip your morning coffee in The Bluebird's Lobby. Among the shops to visit while in Cambria is Seeker's Gallery, where we found hundreds of gifted glass artists represented in what is included in America's top 100 fine craft galleries. Robin's Restaurant is a favorite among visitors and locals and offers fireside and patio dining. If you did not stop in Harmony on your way into town, you may wish to drive back six miles to experience this tiny artist colony and it's hillside winery. William Randolph Hearst frequented Harmony when it was a small farm to pick up eggs on the way to Hearst Castle. This artisan village is featured in the song Hwy 101 as the writer speaks The Phoenix Gallery, "Where glass is blown in an old dark barn, while Jimi (Hendrix) whines his pearl guitar." Surrounded by softly lit hillsides and Oak, time stands still in this village where couples are still married in a beautiful little chapel shaped as a wine keg. A trip to Cambria would not be complete within a stroll along Moonstone Beach, a tour of Hearst Castle and a walk to the end of the forested peninsula directly below Hearst Castle. This beautiful coastal hiking trail can be accessed just north of San Simeon's small pier, in front of an old gothic wheelhouse where ships once stored materials and treasures that would build and furnish Hearst Castle. This area is a part of William Randolph Hearst State Park and in the springtime the trees on this peninsula are filled with the migrating Monarch Butterflies. You may wish to purchase your Hearst Castle Tickets early in the morning for an afternoon tour as tours fill up mid day and then spend some time hiking on the Peninsula until your tour time later in the afternoon. 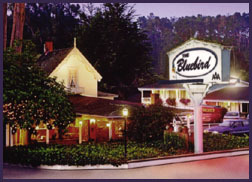 The Bluebird Inn provides quaint creek side motel-style accommodations with the ambiance and hospitality of an historic inn, bed and breakfast and puts you in the heart of a charming coastal village, while minutes from Hearst Castle. © Copyright 2002 Purpose Media. All rights reserved worldwide.